Join the UMKC Roo’s as they battle conference rival Utah Valley on Saturday, January 31 at the Swinney Recreation Center. 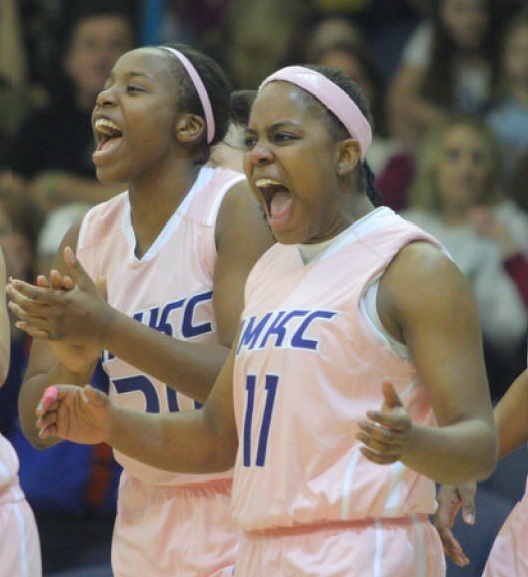 Proceeds from ticket sales of their PINK OUT Game benefit Komen Kansas City! Click here for tickets to the game! In addition, breast cancer survivors will be honored at the tip off and at half-time. Special PINK OUT Game Ball Boys and Ball Girls will be on hand for the annual event as well! Komen KC will also be the beneficiary of the 50/50 raffle during the game too. Komen Kansas City will receive a portion of proceeds from every ticket sold for the PINK OUT Game. In addition, proceeds from the 50/50 raffle held throughout the game will be donated to Komen KC. Calling all breast cancer survivors: We want you to participate in the PINK OUT Game! We are looking for six (6) survivors and a significant other, or child, friend, etc. to be involved in the festivities that day. Tell us why you want to be at the PINK OUT Game (or nominate a friend, etc.) by sending us an email (250 words or less) to tkintchen@komenkansascity.org! Calling all kids (7 to 12 years old): Who wants to be a ball boy or ball girl for the big PINK OUT Game? Have your parent email tkintchen@komenkansascity.org with a few short sentences as to why your child would be a great ball boy or ball girl! Group deals (10+ guests) are available as well (including an autographed team basketball). For more information on tickets contact the UMKC Ticket Office at (816) 23-KCTIX (52849). For information on breast cancer survivor recognition and/or ball boys and ball girls please contact Tiffani Kintchen at tkintchen@komenkansascity.org or 816.842.0410.